There are many definitions of “rural,” and I would argue in the case of the fellowship, “rural fellow” more or less describes fellows located outside of Wisconsin’s two largest cities, Madison and Milwaukee. During the lifetime of the fellowship, rural fellows have been placed in locations such as Shawano, Menominee, Wausau, Stevens Point, Eau Claire, Chippewa Falls, La Crosse, Lac du Flambeau, and Wisconsin Rapids - where I am placed. These are not all small towns - Wausau is the largest city in northern Wisconsin with almost 40,000 residents, while La Crosse has a population of 51,834, and Eau Claire boasts 68,587 residents. Even the smaller towns are still located near larger cities. I say this because I think sometimes “rural fellow” might scare people off a bit by leading them to think they’ll be in a town of a few hundred people with nothing to do for 2 years, but this is far from reality. Okay, I’ll stop with my geography lesson of fellowship placements now, and talk about something I know more about - my own experience as a rural fellow. Let’s start at the beginning. I grew up in the Northeastern region of Wisconsin in an unincorporated town and attended high school in a town of about 7,000 people. It was my experience growing up in a rural area and seeing the various issues affecting my community that led me to pursue a degree in public health. To be clear, I am by no means “against” big cities - I actually lived in Madison and Milwaukee for 6 years for undergrad and grad school before returning to rural Wisconsin, and I loved every second of it and I still get excited when I get to visit those places. But even after those experiences, my heart remained in rural Wisconsin which is why I was so excited about the opportunity to be a rural fellow. My placement site is the Wood County Health Department, which is responsible for serving about 73,000 residents throughout the county. To provide a bit more context for those who might be unfamiliar, Wood County is smack dab in the middle of the state - Pittsville, a town located in Wood County, is actually the geographical center of Wisconsin (you’re welcome for the fun fact). 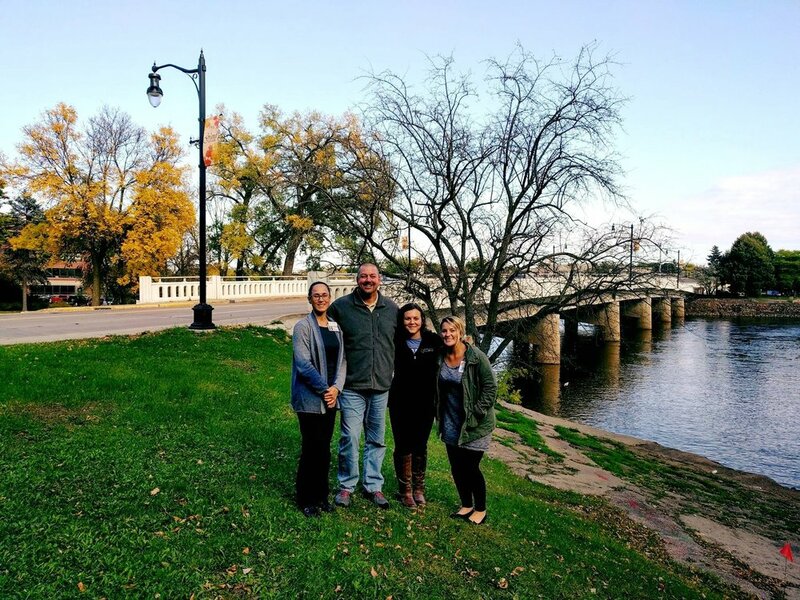 I work in the health department, which is located in Wisconsin Rapids, a beautiful city along the Wisconsin River, home to 17,806 residents. As my time as a fellow is quickly coming to an end, I’ve learned there’s both opportunities and challenges that seem to be unique to rural fellows, and I’d like to share what I think has been my biggest challenge and biggest opportunity so far along my journey. In my experience, the most challenging part of being a rural fellow is not being located close to other fellows. For example, some of the Madison-based fellows get together regularly for lunch and some of the Milwaukee-based fellows occasionally meet up for coffee or activities. I’m located at minimum a 2 hour drive from the locations where other fellows are currently placed, including the other rural fellow. This is challenging because it would be great to get together regularly in-person to share our experiences, have reflection time, carpool, and just enjoy some fun, social time together. Luckily, we have our monthly Learning Community meetings where we all get together for the whole day, and this has definitely been one of my favorite parts of the fellowship because of the relationships fostered during these days. On the flip side, one of the biggest opportunities of being a rural fellow who’s not located close to other fellows is you’re often provided more leadership opportunities since you’re the only fellow in the region. I was fortunate to have been placed at the Wood County Health Department where they are looked to as a statewide leader in public health and are very progressive in their work. Two of my biggest projects during my fellowship have been focused on advancing health equity and incorporating a health in all policies (HiAP) approach within the City of Wisconsin Rapids by conducting health impact assessments. These are big projects the health department needed a fellow to take the lead on due to limited internal capacity. Health equity and HiAP are newer concepts within the local health department context in Wisconsin and few local public health workers are proficient in these areas, so this was a unique leadership opportunity for me. Had I been in a larger organization with more capacity, it’s unlikely I would have been given such a big leadership role in these projects. I definitely was not an expert in either of these areas when I came to Wood County, but I was eager to learn as much as I could about these topics, and I learned how to be proactive, independent, and brave in the process of leading the health department’s health equity and HiAP work. I want to keep this blog brief, so I’ll wrap it up, but the main things I want people to know about being a rural fellow are 1. It definitely doesn’t mean living in a remote place with nothing to do; 2. Not being located near other fellows can be challenging; and 3. Unique leadership opportunities are abundant. My fellowship experience has been incredible, and I wouldn’t trade my time as a fellow for ANYTHING.